Yeah – I have no business whatsoever calling this Chicken Cordon Bleu. 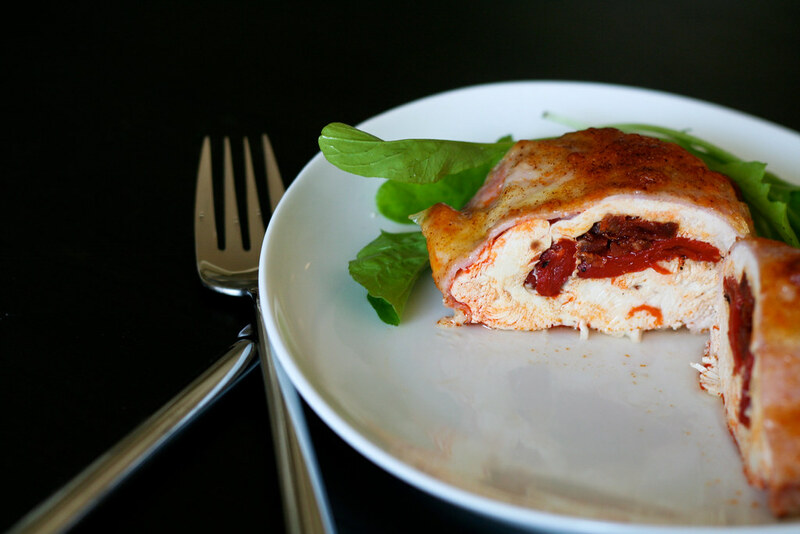 It’s more like Spanish-style stuffed chicken breasts wrapped in ham and cheese. But that’s not the most eye-catching title. Whatever you call them, tadalafil these chicken breasts are pretty amazing. Also, visit this site pretty simple to make. Just butterfly some chicken breasts and stuff them with spicy Spanish chorizo and Piquillo peppers (roasted red peppers work too). Close them up, wrap them in ham and cover with a slice of provolone cheese and a sprinkle of smoked paprika. Into the oven for a bit, and out comes a one of the best chicken dishes I’ve ever made. Feel free to brine your chicken before using. I didn’t (because I’m lazy) and the chicken was still surprisingly juicy. Must be all that pork fat and pepper juice. Preheat the oven to 350° and grease a casserole dish. Butterfly the chicken and stuff each breast with 1 oz. chorizo (1/4 the amount) and 2 piquillo peppers (or 1 red pepper). Close the chicken breast up with your toothpicks. 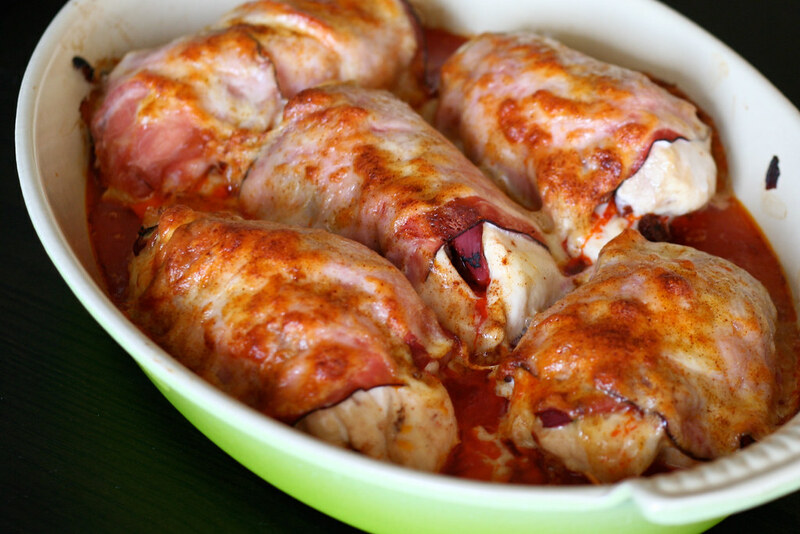 Wrap each chicken breast with a slice of ham and place in the greased casserole dish. Cover each piece with a slice of cheese and sprinkle all over with the smoked paprika. Bake for 30 – 35 minutes, or until the chicken is cooked through and the cheese is melty and brown. How does Tom not weigh 400 lbs? This looks awesome – what a great idea. Yumm! Pig and paprika make any dish better. Great job! CHicken breast is a wonderful with a variety of stuffings. very nice flavor combo. to spanish it up even more you could use jamon serrano – but that would also add some more $$$ to the meal! Great weeknight dinner, I love stuffed chicken breasts. I think I will use Serrano for the outside and try it with the peppers inside! May be a silly question, but I assume the chorizo you used was smoked and not the chorizo that must be cooked? Favaunt – I’ll work on fattening you up next week. If chicken breasts are making a comeback this is it,this is the way. This is a great idea, thanks for sharing! Whatever what you want to call these, they look fantastic! I also worry about chicken breasts being too dry, but the fat from the chorizo and provolone would work well to add moistness. This dish looks scandalous! Question, can I sub manchego cheese for the provolone or does it really need to be a really soft cheese? Mimi – I wouldn’t use manchego because it doesn’t really melt. Maybe a young manchego or a mahon cheese would work. Provolone would definitely work. Just found you..this looks awesome! Now can you make a recipe called “doughnuts on your lawn” ?